There are several illnesses/diseases transmitted to humans by mosquitoes. The most common in our area is West Nile Virus. However, in 2016, Zika Virus showed up locally in people who have returned from parts of the world where Zika Virus has been spreading rapidly. 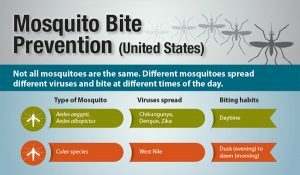 You can reduce your risk of being infected with mosquito-borne illness/disease by using insect repellent and wearing protective clothing to prevent mosquito bites. Below is the latest on Zika Virus and West Nile Virus. Click here to see what our Environmental Health Division is doing to monitor for West Nile Virus. Click here for more prevention tips.